Ever since spending a couple of weeks in Israel a few years ago, I have been on the seemingly end less hunt for the perfect hummus back in the US. Thankfully, my search may have just come to an end the other night, after dining at Byblos Cafe: Greek & Lebanese. The new owners, Joe and Justin Khraim, recently moved to Denver after traveling around for 9 years searching for the perfect city to open up shop; namely, a place that they felt was lacking mouthwatering falafel and shawarma hot off the block. just settle on a fountain drink before trying their fresh Lebanese Iced Tea: a refreshing concoction made from tea, rosewater, and lemonade. Once your thirst has been quenched, it’s time to try out the Mediterranean Hummos, which was undoubtedly my favorite part of my dining experience at Byblos Cafe. 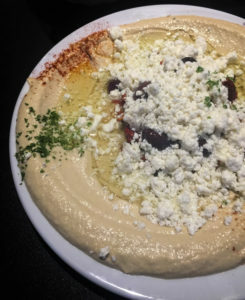 The smooth and creamy hummus, which is topped with sun-dried tomato, feta cheese, olives, roasted garlic, and paprika, is served alongside freshly-baked pita bread. The little pool of olive oil in the middle of the hummus plate is pretty much a tell-tale sign that you’re about to devour freshly-made and authentic hummus. Their chickpea-Tahini concoction is far beyond comparable to the store-bought varieties, and it’s going to be hard to go back to my carrot sticks and Sabra afternoon snack combo after trying Byblos Cafe’s house-made spread. If you’re a vegetarian looking for good some flavorful veggie options in this city, you’re in luck at Byblos Cafe. 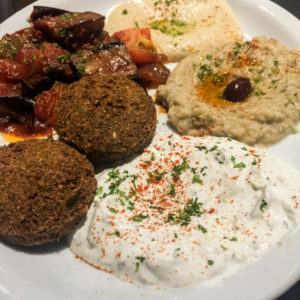 Order a ve getarian plate, which comes loaded with falafel (made from scratch, every morning), feta cheese salad, mousaka, rice, babaganoush and hummus (that’s right, because you didn’t have enough before!). 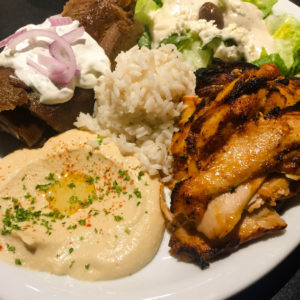 For those interested in sampling more traditional mediterranean meats, the chicken shawarma or gyros, which are made in-house daily and sliced thinly to perfection, will satisfy your cravings and have you wondering where you can buy your own spinning broiler. A variety of sandwiches (such as the Souvlaki and Falafel) and salads on the menu also incorporate the Greek/Lebanese flavors in a more standard form, which I know are going to be way too convenient for when I need a take-out meal on a busy night. Living only a 3-minute walk away from this place is going to be dangerous! We certainly can’t forget about my favorite part of every meal: dessert. 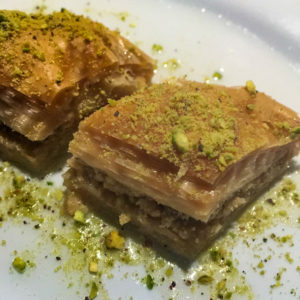 Byblos Cafe serves delicious Baklava formed from a light and crispy pastry dough, cinnamon, honey, and sprinkles of nuts on top. 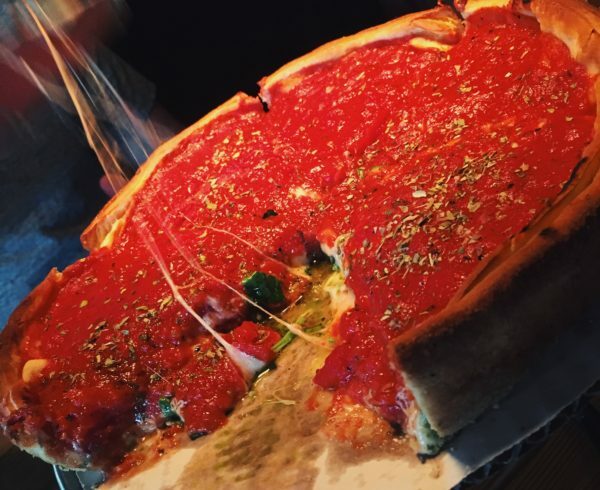 It’s sweet, it’s buttery, and it’s the perfect way to end your dining experience. After dining at Byblos Cafe, I can officially say that I’ve called off my hummus hunt and discovered some flawless falafel. The new owners of this revamped Mediterranean restaurant certainly know how to transport you from Denver’s 4th and Corona Street to the Mediterranean seaside for a meal of the authentic flavors of traditional Greek and Lebanese food.